Project Merlot returned to the track on 29 August with a visit to the Cadwell Park circuit in Lincolnshire for another day organised by Javelin Trackdays. 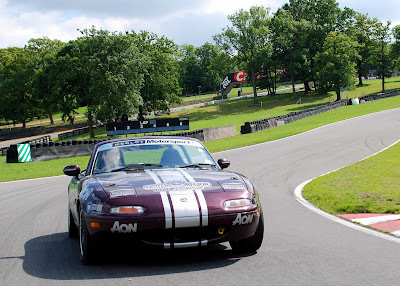 FINALLY, Project Merlot makes it on to the Famous Brands Hatch racing circuit! But on this occasion the speeds were somewhat less then the car is used to when on a track. 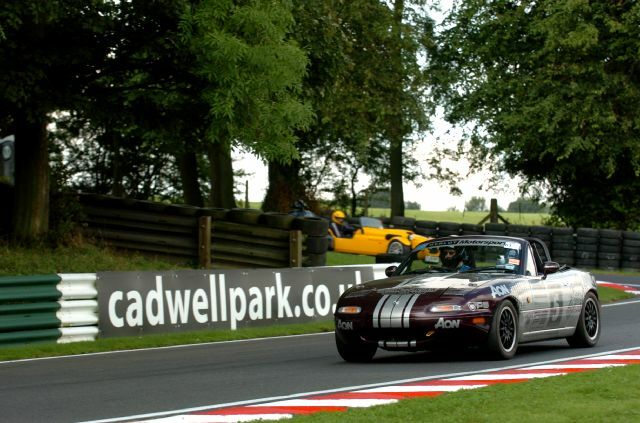 The car was taking part in a parade lap with nearly 30 other MX-5s from the Owners Club who were invited onto the track by MaX5 Racing who were in action that day. Check out the video of the Merlot on track, thanks to Chris Gage. 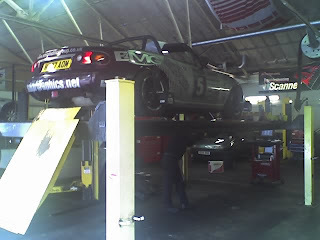 On the afternoon of Saturday 25th August Project Merlot spent a couple of hours on a 2 post lift in the workshops of EMG Motor Group where Team Merlot set to work fitting a new set of front brake discs (supplied by EMG), Front & rear Axxis Ultimate pads and Front & rear Flyin' Miata adjustable anti-roll bars (supplied by Performance 5). This was all in preparation for it's track day at Cadwell Park on the following Wednesday organised by Javelin Track Days. At extremely short notice the Merlot was squeezed into a spare time slot with Wheels Inmotion for a full geometry check and adjustment. After discussing with Tony our requirements for the little "racer" he proceeded to dial in the desired amount of caster, camber & toe-in ensuring the car would be predictable and controllable for any ability of driver who maybe behind the wheel. 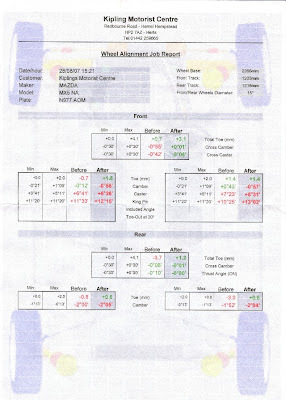 Click the pic below for alignment setting details. See the Cadwell Park trackday blog for the full report on how the car behaved after these latest tweaks. PROJECT Merlot along with 40 other cars from the MX-5 Owners Club Eastern Region and local Mazda Dealer Underwoods of Colchester was on show at the Helmingham Festival of Classic and Sports Cars. The annual event held in the ground of the stately home near Ipswich attracts hundreds of classic and sports cars every year.